You may be wondering where my creative energies have run off to lately, and I’m pleased to finally announce part of the answer. Craft Stylish, a new website launched by the lovely people at Taunton Press. I’ve been posting over there, all about crochet, my other crafty love. Sometimes I wonder if anyone who reads this blog knows that I love to crochet, since I rarely post about it, but that’s just because it can be hard to make crochet exciting in a quick post. I’ve actually found lots to post about at CS, and new cool crochet stuff continues to crop up the more I look for it. So far I’ve been writing lots of how-tos, tips, book reviews and roundups on cool crochet sites , projects, and designers. If you happen to know of anything that might be good for a future post, please feel free to drop me a line any time! Here’s one of the photos from my Granny Square tutorial– my goal is to take close-up shots and clearly show my hands so you know what’s actually going on. Imagine me with my self timer, gorilla pod, akwardly dangling camera cord and yarn ends everywhere, doing everything half-bent over till my back starts to yell at me. What, you couldn’t tell from the photo? That’s good! I need a staff, I tell you! Head on over and check out the site– there are lots of original posts on all things crafty, including beading, sewing, and embroidery. You can register and comment, too, and I’m told there’s more to come! What a nice way to pass the Friday. Great! I hadn't wandered through your section yet- I'm off now. Can't wait to try out your tutorial! Not sure I have the basic skills, but I have a friend who will get me going! Thanks! I decided to stop lurking in the dark and tell you, that I thoroughly enjoy reading your blog =) I even read all of the older entries. Your love for crocheting actually was what lead me here first. 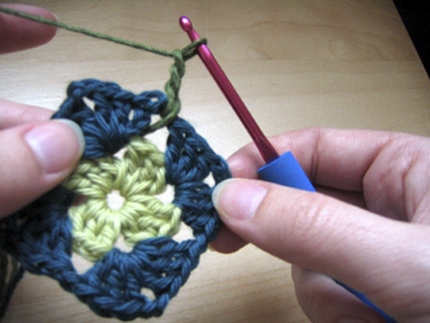 My mum taught me to crochet when I was 3 or 4 years old. Unfortunately, I stopped doing it (for unfathomable reasons) for almost 14 years and only started to relearn it recently. Since I am also trying to learn how to sew and searching for a new job and loads of other things, I'm not sure I will make it. BUT, your blog keeps me motivated, so mabye, sloooowly I'll come to it.